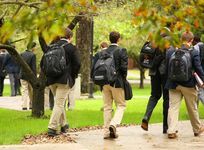 Portsmouth Abbey School is a Catholic, co-educational boarding and day school for students in grades 9 through 12. The school is located on a beautiful 525-acre campus along Narragansett Bay, just a few miles from Newport, RI. For over 90 years, the Abbey`s liberal arts curriculum has prepared students for lives of significance and purpose. This education is grounded in the Western intellectual tradition and teaches students to solve problems, communicate ideas, work together, and innovate. Portsmouth Abbey Boarding School Avg. People that viewed Portsmouth Abbey School also viewed these schools: St. George's School, Westminster School, Tabor Academy, Kent School and Deerfield Academy.